DAVID OF THE WHITE ROCK. Give me my harp, my companion so long, Let it once more add its voice to my song; Though my old fingers are palsied and weak, Still my good harp for its master will speak. Often the hearts of our chiefs it has stirred, When its loud summons to battle was heard ; Harp of my country, dear harp of the brave, Let thy last notes hover over my grave. Ncithiwr mi glwyais lais angel fel hyn : " Dafydd, tyrd adref a chware trwy'r glyn" Delyn fy mebyd ! jfarwel i dy dant, Duw a'ch bendithio, fy ngweddw am plant. 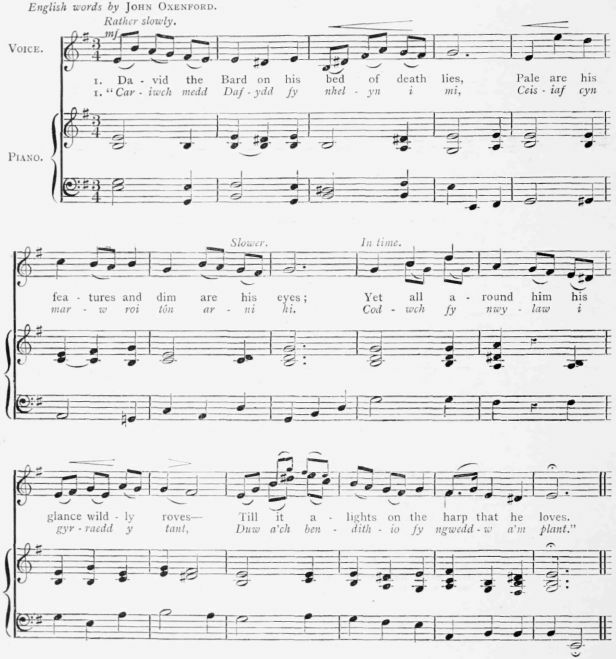 The Welsh tradition is that ,1 Bard, who lay on his death bed, called for his harp and played the above air, requesting at the same time, that it might be performed at his funeral:'�and it was accordingly played on the harp, at the Parish Church of } nys Cynhaiarn, in which parish the house called "Gareg-Wen" (Carnarvonshire) is situated. �?. Parry's " Welsh Harper," p. no.